Salam. The following is the biography of one of the scholars from the al-Mulla family whose beginners text on hanafi fiqh is currently being proofread and edited for publication (May Allah the Exalted facilitate its completion). The author of this work is the Imam, the Mufti, the Proof of the Sacred Law (Shariah), Ibrahim bin Hasan al-Mulla, al-Hanafi, al-Ahsai. Sheikh Ibrahim was born in the city of al-Ahsa, in the area called al-Koot. This neighbourhood of the city was the residence of a number of scholars and pious people. The exact date of his birth is unknown, however it is clear that he was born around the end of the tenth century (Hijri). As for his passing away it was on the seventh of Shawwal 1048 (Hijri) in the city of al-Ahsa. Our author studied with his maternal uncle and other scholars of the city. Over a number of years Sheikh Ibrahim studied, Aqidah, Usul, Hadith, Tafsir, Grammar, Logic and Tasawwuf. Until he attained a firm grounding and a high standing in terms of knowledge. His level of knowledge was at a level was such that he was counted as being amongst the scholars of his city. He was given Ijazah and praised by a number of scholars. Our author did not limit his search of knowledge to the scholars of the al-Ahsa and their praise of him. Rather he set off in the pursuit of knowledge to the Hijaz and met and studied with the major scholars of the holy sanctuary, benefiting from both the resident scholars and those visiting. Sheikh al-Islam Wajih al-Din Abd al-Rahman bin Isa al-Murshidi al-Hanafi who was the Mufti of the Hanafi school in Makkah. He wrote for our author a lengthy Ijazah indicating in it his firm grasp of the various Islamic disciplines. Sheikh Muhammad al-Rumi. He was described as the Qadi of the two holy sanctuaries (Haramain). Our author attended his lessons of the tafsir of al-Baydawi. He studied the science of the purification of the heart and manners from his maternal uncle and then with Sheikh Taj al-Din al-Naqshbandi al-Hindi. This was when Sheikh Taj al-Din visited al-Ahsa. Sheikh Muhammad bin Nasir, the Shafi Mufti and ancestor of the Aal Abd al-Latif family. Sheikh Ibrahim bin Hasan al-Mulla al-Ahsai al-Hanafi, (is) from the major scholars and Imams adorned with the quality of conviction and engrossed with worship. He was a jurist, grammarian, well grounded in a number of sciences. He studied in his city with a number of scholars and studied in Makkah with its jurist Abd al-Rahman al-Murshidi who wrote for him a detailed license indicating in it to his expertise in the Islamic sciences. He took the path from the knower of Allah (most high) Sheikh Taj al-Din when he came to al-Ahsa, and in turn from him al-Amir Yahya bin Ali Pasha the ruler of al-Ahsa…he has a number works in different sciences…and he has a large amount of poetry. Al-Ajwibah al-Ibtisamiyah – A collection of answers to questions sent to him. Hidayah al-Murid Sharh Jawharah al-Tawhid- A commentary to Imam al-Laqqani’s well known poem on belief. Hadiyyah al-Nasik fi Ahkam al-Manasik– A text on the legal rulings related to Hajj. Daf’ al-Asa fi Adhkar Sabah wal-Masa– A collection of invocations for the morning and evening. Bast al-Kasa– A commentary on the previous text. Manzumah fi Adab al-Akal wa al-Shurb– A poem on the etiquettes of eating and drinking, the authors grandson Sheikh Muhammad bin Abd al-Rahim authored commentary on it entitled Miftah al-Qurb. Uqd al-Uqyan fi Shuab al-Iman– A poem on the branches of faith. Tuhfah al-Mubtadi– A brief introductory text for beginners on Islamic law covering the legal issues related to purification and prayer according to the Hanafi school. This is the text which is before you. Turfah al-Muhtadi– A commentary of the previous text. Sharh Risalah al-Tajiyyah– A commentary of a letter sent by Sheikh Taj al-Din al-Hindi to his student al-Amir Ali Pasha, the ruler of al-Ahsa. Al-Fatawa al-Ibrahimiyyah– A collection of legal verdicts issued by author and collated by one of his students. Sharh Manzumah al-Imritiyyah– A commentary of a text on grammar. Manzumah fi Mawadi’ al-Salat ala al-Nabi– A poem of all the places where one should send Salutations and Salutations upon our Master the Messenger of Allah (Allah bless him and give him peace). -Praising the One who created man, and ennobled him with knowledge and clarity. Salutations and blessings upon the choicest of His creation, the Master of the children of Adnan, upon whom was revealed ‘Recite and your Lord is most generous’. To proceed: the loftiest of objectives is the adornment with knowledge and embellishment with manners (adab) accompanied by following that which has been ordered and leaving that which has been prohibited. For one of those who who kept his eyes awake in its attainment, and spent him time in knowing and completing, the striving student, Muhammad bin Allamah Abi Bakr al-Mulla al-Ahsai. He received and studied the sciences mentioned above in our school ‘Al-Sawlatiyyah al-Hindiyyah’ in Makkah the protected, established by the erudite and righteous, the deceased Mawlana al-Sheikh Rahmatullah bin Khalil al-Rahman al-Hindi. Appreciating his efforts this certificate was awarded to him from the the school so that reliance may be placed on it. And by Allah is success. Salam, the above is a very rough translation of the meaning of the main paragraph of the above certificate. Some of us went through a basic reading of the whole of Mukhtasar al-Quduri last year with Sheikh Bandar Abdullah al-Mulla in the Dawsari masjid located in the the Gold Belt area of al-Khobar. Sheikh Bandar is credited (Allah reward him) with helping us in meeting the hanafi scholars from al-Ahsa belonging to the Mulla family. He also gifted us with a number of works in fiqh which can only be described as ‘Tarjuman al-Qalb’. After the seminar on the four madhabs in al-Ahsa which took place in Dammam, and at which Sheikh Bandar presented a brief history of the hanafi school, he gifted a book to me by his father in law on the history of the different schools in al-Ahsa. 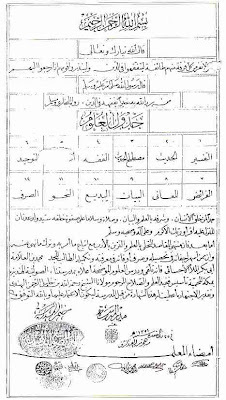 The work contained amongst other things a copy of Sheikh Muhammad al-Mulla’s certificate of graduation from Madrassa al-Sawlatiyyah in Makkah. I had been meaning to scan it and place it on the internet for others to benefit from, but was delighted find that someone else had already done so. This certificate emphasizes the important point that tasawwuf is not divorced or alien to the studying and teaching of sacred knowledge. This is what scholars such as Sheikh Muhammad al-Mulla dedicated their life to and this is what they passed on to their students, and this is what we witnessed ourselves and were told by them. We have recorded evidence of Sheikh Abu Bakr (Sheikh Muhammads father) being presented with poetry written by his students expressing their happiness and joy at the return of their teachers son from the Hijaz after completing his studies. Sheikh Muhammad al-Mulla’s son Sheikh Yahya mentioned to us that his father was: ‘An ocean in both outward sacred knowledge and tasawwuf’. May Allah (the exalted) have mercy on all those mentioned in this post. Salam, I found the following biography of the author of ‘It-haf al-Talib’, namely Sheikh Abu Bakr al-Mulla al-Ahsai. The interesting thing about it is that it was published in India quite some time ago, and reminded me of some of the links between the people of al-Ahsa and the Indian Subcontinent. The first time that we met Sayyid Ibrahim al-Khalifah, an elderly Saudi man came into the room, Sayyid Ibrahim told me that he could speak Urdu/Hindi, I smiled back politely not expecting much, to my surprise the elderly gentleman proceeded to speak very clear and grammatically correct urdu/hindi. Puzzled I asked where he had learnt it, and he replied that he lived in India with his father who traded there, he spent a number of years living in Bombay, and was sent back home to al-Ahsa at the outbreak of the second world war! I met other al-Ahsa people who mentioned their family members who were buried in India due to their passing away whilst working there, this was all before the Saudi ‘Industrial Revolution’ which turned the flow of workers in the opposite direction. As for the hanafis, then one of the Scholars of the al-Mulla family whom I’m not sure if is still alive (he was in a comatose state when I was in al-Ahsa last year), namely Sheikh Abdullah bin Abd al-Rahman al-Mulla. He was born in the year 1330 (nearly 100 years ago), he studied with the scholars of al-Ahsa, then proceeded to study in India at Dar al-Ulum Deoband. It is said that his certification from Dar al-Ulum Deoband makes him the first Saudi to gain a university degree. Sheikh Yahya al-Mulla’s father, Sheikh Muhammad al-Mulla had some students from the indo-pak subcontinent. Once when I was with Sheikh Yahya he went to his room and returned with an urdu translation of the short text by Sheikh Abu Bakr al-Mulla entitled ‘Wasilah al-Talab’. He added that a student of his father who had returned back to pakistan had translated it, I didnt note down the Sheikhs name, but I was told that he had passed away. I also discovered that one of the fastest growing tariqahs in pakistan, namely the Idrisi’s, whose Sheikh resides in Pakistan itself was the murid of Sheikh Muhammad al-Mulla. These are some brief comments, and are by no means exhaustive, the picture below is of the cover of the biography of Sheikh Abu Bakr al-Mulla published in India. 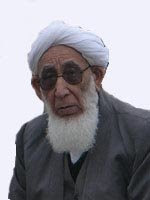 Sheikh Nur Muhammad Nurizad, the Sunni scholar, Imam and Khatib of the Friday prayers in the town of Kanbad Kawas in northern Iran passed away recently on the 14 of Rabi al-Awal. He (May Allah have mercy on him) was a pious sincere scholar who spent over 60 years of his life in teaching, and was regarded as one of the most notable Sunni Qadi’s and Mufti’s of Iran. I found this old picture of Sayyid Ibrahim al-Khalifah who is a Shafi Scholar and respected for his attention to the sciences of hadith. I visited him twice in al-Ahsa, once at his masjid opposite the fort pictured elsewhere on this blog. The second time was in the basement of his home where he was reading Sahih al-Bukhari with his students. He began the lesson by reading hadith for quite some time, and then went round each student asking them to read several hadith each, alhumdulilah I was honoured to be able to read to him when my turn came. After the dars I asked him for Ijazah which he kindly gave me, unfortunately I do not have his thabat at hand to scan, however it should be noted that he narrates from over 70 different Shuyukh. He has studied the Shafi madhab with the scholars of al-Ahsa, is known for his abilities as a Munshid and has a number of students, some of them quite young who study with him and look up to him as a father figure. It is not difficult to see why as the Sheikh is one of the most friendliest scholars I have met, and one quickly feels at ease around him. May Allah swt keep him in good health and enable us to benefit from him further. Many a time when browsing in a bookshop I find works by contemporary scholars which make me think: Why! I found the following quote in the interesting autobiography of Sh. Abdullah al-Ghumari which pretty much sums up what should be kept in mind by all authors. I would perhaps add an extra point, namely that of editors meticulously editing material which have not received critical editions, but perhaps this could be incorporated into one of the seven reasons, as editing as in the modern form did not exist at the time of Imam al-Maqqari.